Cut tortillas to size if necessary (5" - 6"), and shape into a cup inside of a muffin tin. Cook ground turkey on the stovetop, and add in the Manwich, cumin, taco seasoning and onion powder. 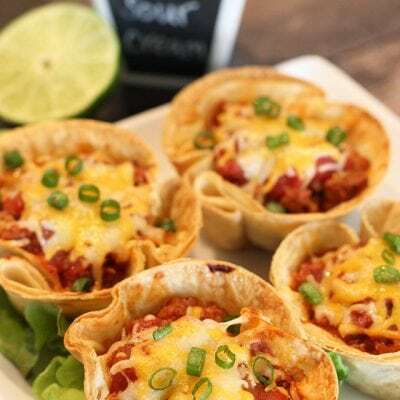 Spoon meat into the tortilla cups, and top with a generous spoonful of salsa and shredded cheese. Bake for 10-13 minutes until cheese has melted and the tortillas are golden brown. Enjoy with sour cream, guacamole and green onions if desired.